There are many opportunities to contribute at St. Luke’s in offering service to others in need within our community and throughout the world. Once a month, we provide a free community meal to those in need. See the Community Meals page for more information about the Community Meals and our Calendar for the schedule of upcoming Community Meals. We have been supporting the Fifth Tuesday meal served at First United Methodist Church in Cedar Falls on each fifth Tuesday for around 25 years. We share the responsibility with four other churches: First Christian Church (Disciples of Christ), Cedar Valley Unitarian Universalists, United Church of Christ, and Community of Christ. Our contribution is to collect monetary donations from the other churches and to purchase the food, which is added to food donated by the other churches. 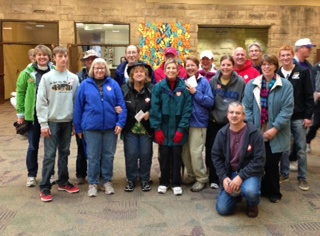 Members from St. Luke’s frequently participate in the CROP Walk each fall. Funds donated to the CROP Walk are addressing hunger overseas through the work of Church World Services and locally through the work of the Food Bank and the Jesse Cosby Neighborhood Center. The generous people of St. Luke’s fill our narthex food basket, and the Northeast Iowa Food Bank is grateful for each donation. There is an ever-growing need of gifts of food and personal care supplies. Cash donations are always very welcome, since the Food Bank can use it to purchase food at a substantial discount. St. Luke’s often contributes a portion of the proceeds from its annual Lasagna Dinner to the Food Bank. Generous contributions make it possible for Community Partnership for Protecting Children (CPPC) to provide necessities to many families that lack them. CPPC operates from the Neighborhood Hub, located in the lower level of Mt. Carmel Church in Waterloo. During the holidays, St. Luke’s reaches out to the Cedar AIDS Support System (C.A.S.S. ), part of Cedar Valley Hospice. Many of their clients are living beneath the poverty level, so our gifts of gift cards, cash donations, personal hygiene items and paper products are most appreciated. 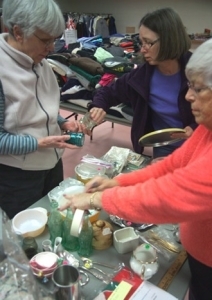 St. Luke’s is responsible for providing runners for Meals-on-Wheels one week in February and two weeks in September. Organized through the Cedar Falls Community Center, volunteers help deliver meals with scheduled drivers directing the activity. We have regular volunteers, but more help is always welcome. St. Luke’s has partnered with Downtown Waterloo Rotary to serve women who visit Refuge Belen in Chinandega, Nicaragua. Refuge Belen provides maternity care for women of poverty in Chinandega, Nicaragua. These women may walk 20 miles or more or a ride a bus longer distances just to access maternity care. Refuge Belen is a clean, safe, medically supervised place for women as they await the arrival of their child. While there, women are taught how to care for their babies. We have joined PEO Chapter KL, St. Wenceslas Catholic Church-Iowa City, and women in Cedar Rapids, Wisconsin and Pennsylvania to make cloth diapers from T-shirts. These are included layette bags that are filled by members with supplies for the newborns and a few extras for the mothers as well. In addition to the layette bags, we also partner with Rotary to provide shoeboxes of clothing, toys, toiletries, school supplies and other gifts to the “children of the dump” in Chinandega. Over the years members of St. Luke’s have made several trips to Nicaragua to witness the distribution of our boxes. Click Here to find the contents of the Layette Bags.